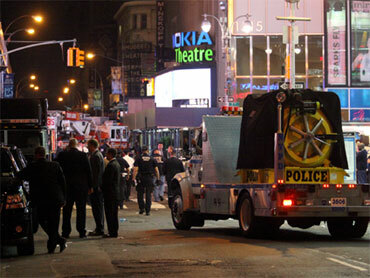 Pakistani intelligence officials on Sunday downplayed a purported Taliban claim of responsibility for the attempted car bomb attack in New York's Times Square as lacking credibility. "There is no credible way to prove that the Taliban have this kind of capacity to attempt such an attack in the heart of the United States," a Pakistani intelligence told CBS News on condition of anonymity. "A claim is far easier to make than to be carried out in real life," he added. The intelligence official was responding to a statement on a website commonly used by Islamists in which the Pakistani Taliban claimed responsibility for the attempt, "in revenge" for two Islamist leaders named as "Al-Baghdadi and Al-Mahajer and Muslim martyrs." A Western diplomat in Islamabad who also spoke to CBS News on condition of anonymity said, "The Taliban have no demonstrated ability to strike in distant places. Structurally, they are far from being a global organization like al Qaeda."